When you think of dietary fiber – the indigestible carbohydrates found in virtually every fruit, vegetable, grain, nut, seed or other plant-based food – you probably picture crisp apple skin, chewy oatmeal flakes or stringy bits of celery. Avocados are a prime example, however, of how misleading the term “fiber” can be. Contrary to the impression given by their smooth creamy flesh, avocados are a good source of fiber. A 2.5-ounce serving of California avocado – or roughly half an average-size fruit, according to the U.S. Department of Agriculture – has about 115 calories and 4.6 grams of fiber. The Florida variety provides close to 90 calories and 4.3 grams of fiber per 2.5-ounce serving, which is about the amount you’ll get from a quarter of an average-size avocado. Although they do fall short of qualifying as a high-fiber food, avocados are still considered a good source of fiber. Whether you prefer the small thick-skinned California Hass or the larger, smooth-skinned Florida Fuerte, you’ll get right around 18 percent of the daily value for fiber from a serving of either. Because fiber comes in numerous forms, it’s generally categorized based on how it interacts with water as it passes through your gut; those that break down in water are soluble, while those that bind to water are insoluble. Although they do work together to some degree, each type is associated with specific health benefits. Soluble fiber prevents blood sugar levels from rising too quickly and promotes healthy cholesterol levels. Insoluble fiber encourages efficient digestion and normal bowel movements. Just over 60 percent of the fiber in a California avocado is insoluble, according to USDA calculations. Florida avocados are even higher in insoluble fiber – it accounts for about 80 percent of the fruit’s total content. People who eat a diet based on fiber-rich foods are more likely to be lean and less likely to develop heart disease and diabetes, according to the Linus Pauling Institute at Oregon State University. Even in the face of these important health benefits, most Americans don’t eat a high-fiber diet. The amount of fiber you should consume depends on your caloric intake, which is why fiber needs generally decrease with age. Based on average calorie requirements, most men and women through the age of 50 should get about 38 grams and 25 grams of fiber a day, respectively. Older men and women can meet their fiber needs with just 30 grams and 21 grams a day, respectively. 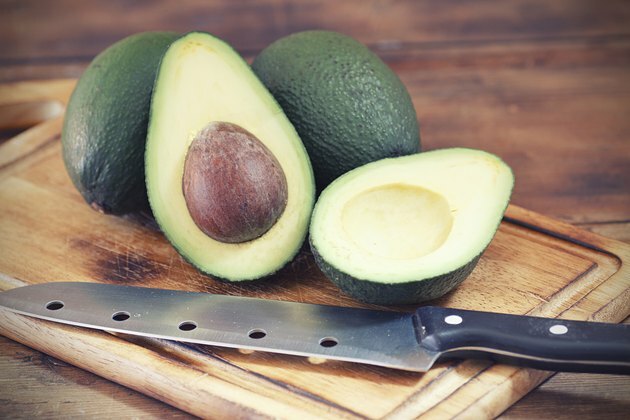 Like most fiber-rich foods, avocados contain a host of other important nutrients. They’re a good source of potassium, vitamin E, vitamin B-6, folate and niacin. They’re also an excellent source of monounsaturated fat, which is known to help reduce high cholesterol levels when consumed as part of a diet that’s low in saturated fat. Fork-mashed avocado makes an instant sandwich spread that’s far healthier than butter or mayonnaise. Toss diced avocado with sliced grape tomatoes, minced onion, chopped mint and whole blueberries to serve alongside grilled fish. You can even combine them with pure cocoa powder, milk, a bit of honey and a drop of vanilla to make a more nutritious – but equally delicious – chocolate pudding.